We will be closed Dec. 18th because it is the third Sunday of the month. And will be closed from Dec. 31st to Jan. 4th as winter vacation. Thank you, merry Christmas and have happy new year. We will be closed tonight (December 11 Sunday) cause of private party. 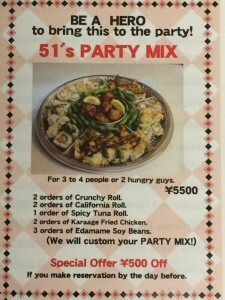 The picture is our newest item, SIZZLER. 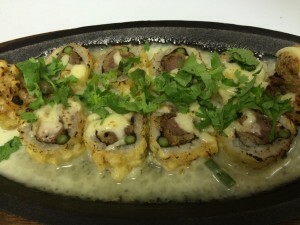 Beef cutlet and garlic stalk roll tempura deep fried, sizzled with wasabi creamy sauce and melting cheese.